Ironlak was a finalist for the Innovation Awards. For building a multiple-product carting with a single add-to-cart one-click process. 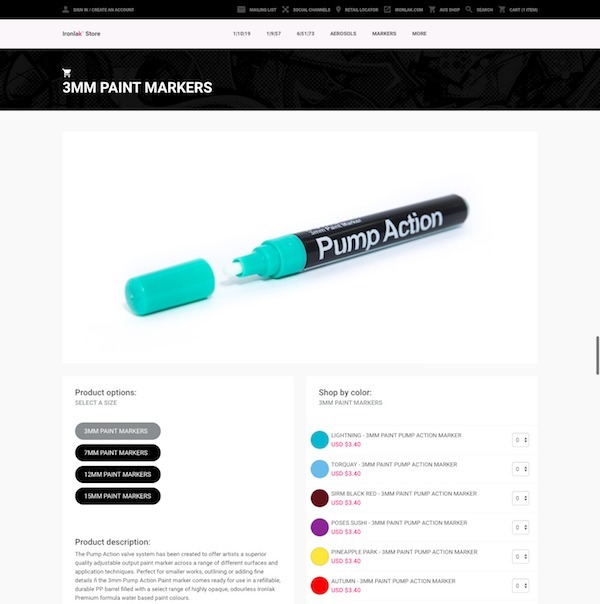 Ironlak is an online store of different types of colours, paints and accessories. It was just like any other regular ecommerce site. But here, the store was dealing in multiple-attribute products with each product coming in various colors, shades and sizes. What if the customer wanted to buy, say, 5 blue markers, 3 green, 7 pink and 1 black –– all in different sizes? Does he/she have to again and again come back to the category or product page, add it to the cart, and then proceed to checkout? Just calculate the number of times he/she would have to navigate from one page to another and how time-consuming and confusing the whole process would be. And this is just an example; real-time scenarios can turn out to be more complicated. Many would suggest a multiple-product add-to-cart function could have easily sorted out the issue, but not even that was the ideal rescue plan. The problem was an iceberg and it was holding our business back. A modified and advanced version of a Multiple Product Carting System at Single Time was required. Ironlak was earlier based on BigCommerce Blueprint theme engine. As it is well known, the Blueprint theme engine did not allow much space for experimentation. It restricted the capacity and capability of theme developers. However, the new framework — Stencil theme framework — has given wings to the developers. It is actually the stencil framework by BigCommerce that has given a free hand to the BigCommerce theme developers to experiment, innovate and invent new things and offer them to the clients. The Stencil framework allows us to easily change and modify the code in a local hosting environment, as well as check and test the code to verify the results. This makes it dead simple to make site changes without impacting the live site. Had it not been for the Stencil framework, offering our new carting system to clients would not have been possible because it required a lot of changes and modifications in the code and scripting, along with multiple test runs. Below are our success stats after Inflexi Technologies took over the Ironlak project. There has been significant growth and success for us in expanding to new horizons via Stencil.